Put all ingredients into a blender and mix for a few seconds until smooth (or use crushed ice and shake well in a shaker). Pour into a chilled old fashioned glass and strew some cinnamon on top (using a template for nice shapes). Note: Instead of sugar, a scoop of vanilla ice also blends well with the aroma of cuerenta y tres. This drink recipe was submitted by one of our gifted readers, Violazr! 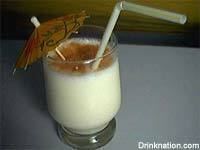 Maybe at a bar is hard to ask for this drink, but just licor 43, milk and cinammon on top makes it one of mi favorites.